My time in Ghana thus far has been fairly focused around wildlife spots. Between the incredible time I spent in Mole National Park as well as the trip I made into Wechiau Hippo Sanctuary I’ve been hanging around more animals than people of late, and that’s fine by me. Every since arriving in Africa, I’ve been testing my ability to suppress instant gratification and just heading south to the land of big animals. I’m a wildlife guy, there’s no doubting that. So it’s been a test of patience to not race through to the big game. As I’ve moved farther south on the continent, however, I’ve done my best to soak up every animal opportunity available. This photo was taken in a village called Boabeng in central Ghana. The village is part of the larger Boabeng-Fiema Monkey Sanctuary. Now, the monkey sanctuary here in Boabeng-Fiema isn’t a sanctuary as you might think. It’s not a rehabilitation center, nor is it a form of a zoo. It is a region that protects the monkeys – as well as the forest they live in – by law, and by tradition. The locals in Boabeng-Fiema believe that the monkeys are sacred. They believe that if you do anything to harm a monkey, the same harm will fall upon you. Thus, the monkeys in Boabeng-Fiema basically roam free in the villages stealing people’s food and living like royalty. Each evening, they descend from the forest into the villages. And although it seems like a scene of chaos, the locals act as if they are not even there. They’ll never swat at a monkey, chase one away, or even yell at one. 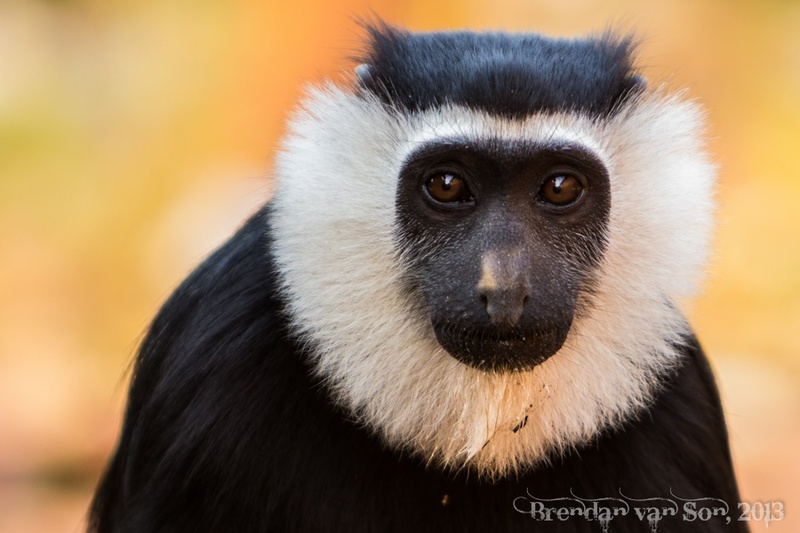 This is a black and white colobus monkey. Most of the monkeys in town are mona monkeys, and it is actually quite rare to be able to get this close to a black and white colobus monkey, even in this village. There will be a full post with more images from Boabeng-Fiema in the next couple days. As if often the case with wildlife, you sometimes just have to sit and wait for them to come to you. You can’t chase wildlife, or it usually sees that as aggression. Thus, it’s sometimes best to find a bit of a hide somewhere and wait for them to come around. Although, most of the monkeys here are fairly used to humans, the black and white colobus wouldn’t go anywhere near someone. They waiting until there were no people in the area and then moved in. I noticed one working its way to a puddle of water, so I found a bit of a hide behind a bush and waited for it to come. It was really startled at first when it noticed me and almost ran away. However, after testing me a little bit by inching closer and closer, it eventually settled down for a long drink from the puddle. Eventually, it sat up and looked directly at me almost with a little bit of a thank you smirk on its face. Technically, I’ll tell you over and over again to focus on the eyes of an animal just like a person. I shot this image at f/4 on my canon 70-200mm f/2.8 which was a good aperture at this distance as it allowed me to get everything from the eyes right to the beard on its chin in focus, while still creating a nice background bokeh. What a close shot. wonder how you get this so closely. Photo of the week… Definitely! Great shot. It looks pretty relaxed.